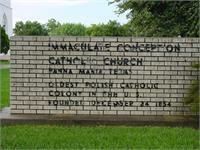 On a trip to South Padre Island, Texas, we stopped a the oldest Polish settlement in the United States! ( It claims distinction as the oldest permanent Polish settlement in America and as the home of the nation's oldest Polish church and school.). We found many polish texans who could speak to our polish nanny Monica. Here is a description of the founding of Pana Maria, although I have to take issue with the title of Polish Ghost Town. On a Saturday morning, we were able to find a full church and many friendly folks willing to try out there Polish with Monica. Poor Monica had a bit of a hard time understanding the South Texas Polish accent. But everyone was very friendly and happy to see the crazy spring breakers (mind you it was my wife and I with our 3 children (all under 3) and our nanny, not the usual spring break crowd. Panna Maria now has it's own website! Panna Maria is the site of the first and oldest permanent Polish settlement in the United States, and now it's home to the nation's first Polish Heritage Center. Mary Lou Gomez was born on the Westside, one of San Antonio's oldest barrios, and poorest. 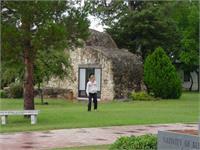 And therefore, the historic corazón of Texas history, too.